Taylor and I knew we were going to get married, it was just a matter of timing. I thoroughly expressed my need to Taylor of a LONG engagement - I had a lot of planning and creating to do and I had specific vendors already in mind that I needed to book. Taylor was gone on an internship the summer of 2012 and was home for just a couple weeks in August/September before he left again for another internship during fall 2012. We had been discussing rings and the one we ended up going with I knew wouldn't be ready in time - I didn't even know if Taylor was taking the bait and actually going through with the ring at that point and I was getting worried, he knew I was taking the fall semester off from school to plan the wedding - I just REALLY wanted a ring to make it more official. He surprised me the night before his internship started with a promise ring since my official engagement ring wasn't ready yet. So I got unofficially engaged on September 5, 2012 - and official engaged on November 24, 2012. So I unofficially had 8 months to plan my wedding - which was perfect! (In my culture people tend to have VERY short engagements - 2-4 months is the norm). My wedding binder was wonderful, I was able to keep all my documents in one place and I could easily take it where I needed to go. Like I mentioned in my last post, I also had a pinterest account and a huge folder on my desktop with many many documents. ^^there weren't many options with my colors so I went with a simple navy binder and personalized it with gold ink. The most important things for me to book early on were my photographer, the temple, and venue. I needed them to all be available on the same day and they were all things I wouldn't compromise. 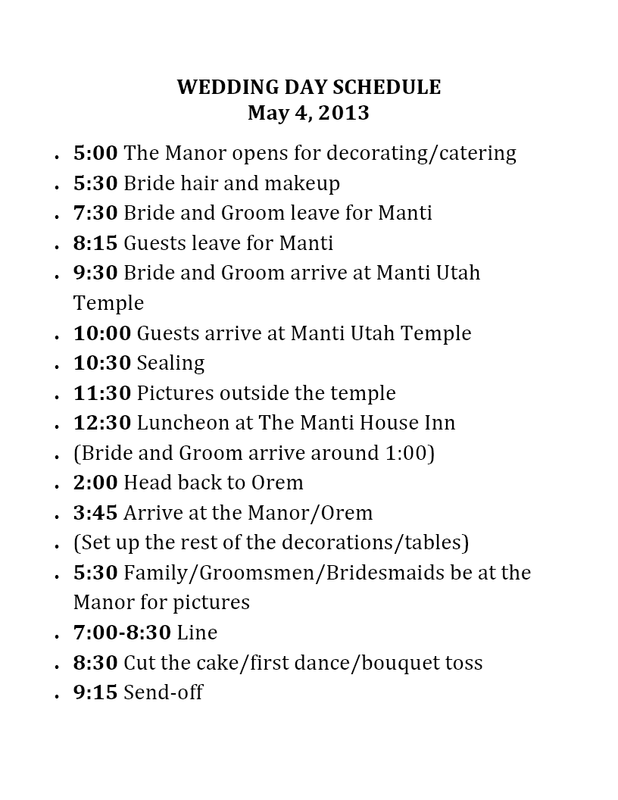 It took me less than 3 days after getting my promise ring to call and schedule those vendors for May 4, 2014 (I just needed to see my potential venue in person and solidify the date). Photographer - I had already done my research. Rebekah Westover. Hands down. She just has such elegant and timeless photos. Working at a bridal store for many years I had seen lots of different wedding photography styles and most bridal photos make me sad because the gown gets washed out and you can hardly see and of the gorgeous detailing - Rebekah somehow captures the details of the dresses and doesn't wash out the gown. I knew Rebekah would capture my gown and our wedding day PERFECTLY. And she did! Best decision. 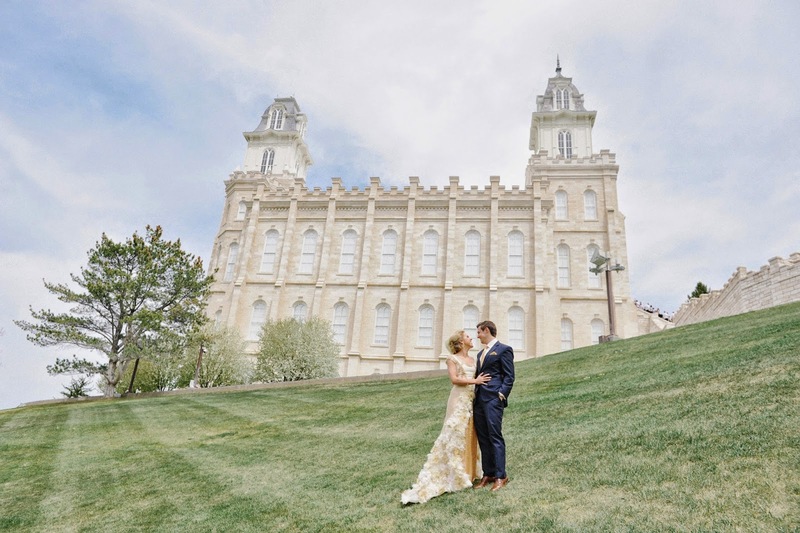 Temple - We had many locations to choose from for our ceremony all throughout Utah and we decided to get married in the Manti Utah Temple. It is a more intimate secluded temple which is about an hour and a half south of where we live. No one we knew had been married there recently. The color of the temple matched my dress wonderfully. The mini road trip added an element of destination to the day. AND the past 3 generations of Taylor's family were married there. It was lovely! 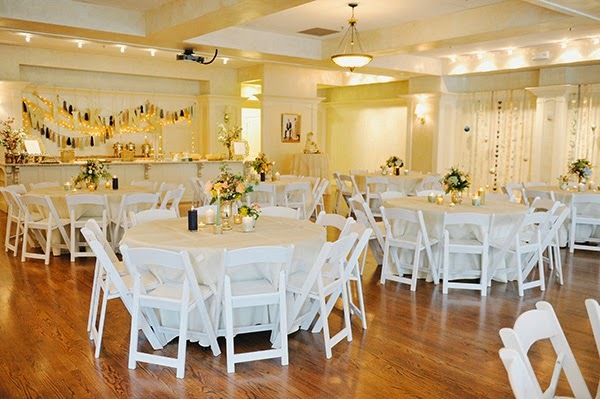 Reception Venue - I was worried I wouldn't find a venue I liked - I wanted something that was elegant but not decorated, because I wanted to add all of my own decorations. I visited the Manor at the Riverwoods and after my first glance inside I was SOLD! 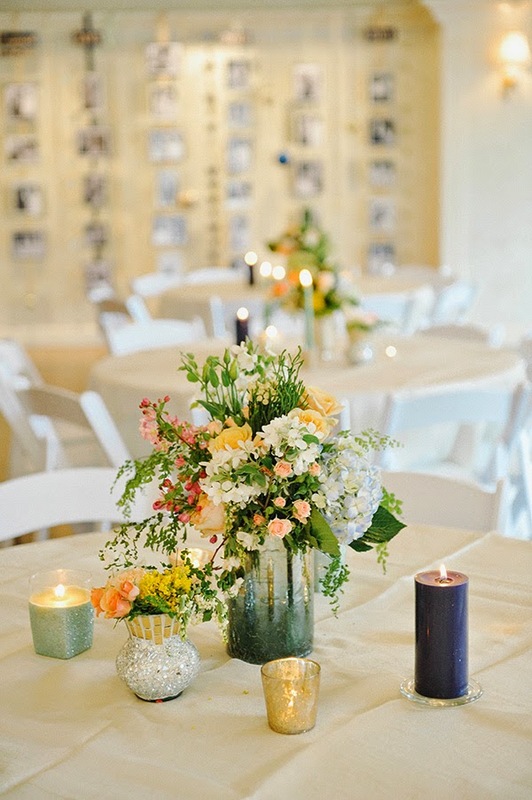 It had a gold tint to the walls, hardwood floor, no weird decorations, it was smack dab in the middle of both of our parent's homes, less than 5 minutes away, AND I could have open flame candles and choose my own catering vendors. It was PERFECTION. I liked it so much I had my bridals taken there as well! 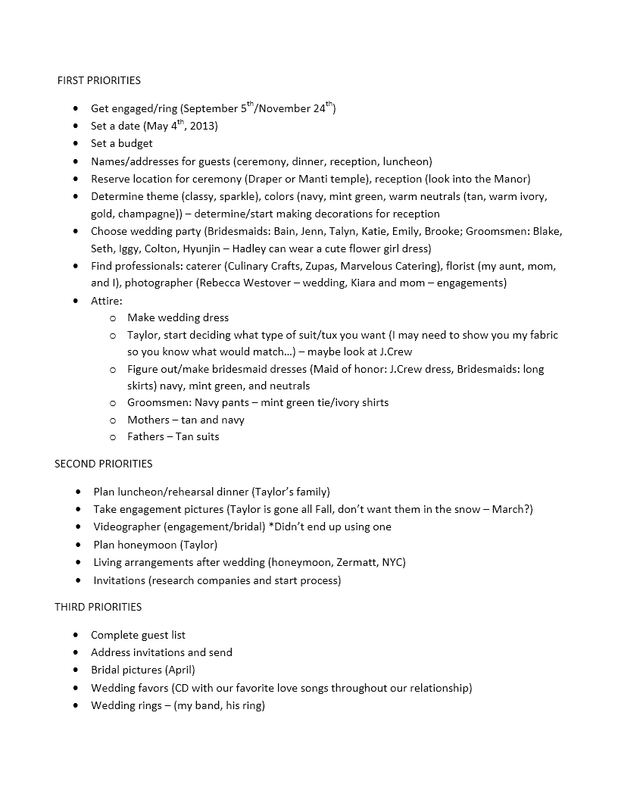 I had created a list of things that needed to be done (thanks to all the million bridal magazines that come through Avenia Bridal) and set deadlines for myself. Personalized notes are always more fun and sincere so I decided to ask my sweet best friends if they would be my bridesmaids through good old-fashioned snail mail. I created a spreadsheet and a budget breakdown in excel to keep track of my finances, I also printed off a basic sheet for my binder with my breakdown and actual costs of things. I set weekly and monthly to-do lists and sent them out to my mom, Taylor, and anyone else who needed to help that week on specific things. 8 months seems like a long time but between spending over 375 hours on a wedding gown, making bridesmaid skirts, designing and creating all of the decorations, and going to school - it was just barely enough time. I had to-do lists on word documents and on excel documents planning everything from appointments, to stuffing invitations, to painting my nails, to specific decoration instructions, to trying to schedule bridals during the end of the semester.. etc. 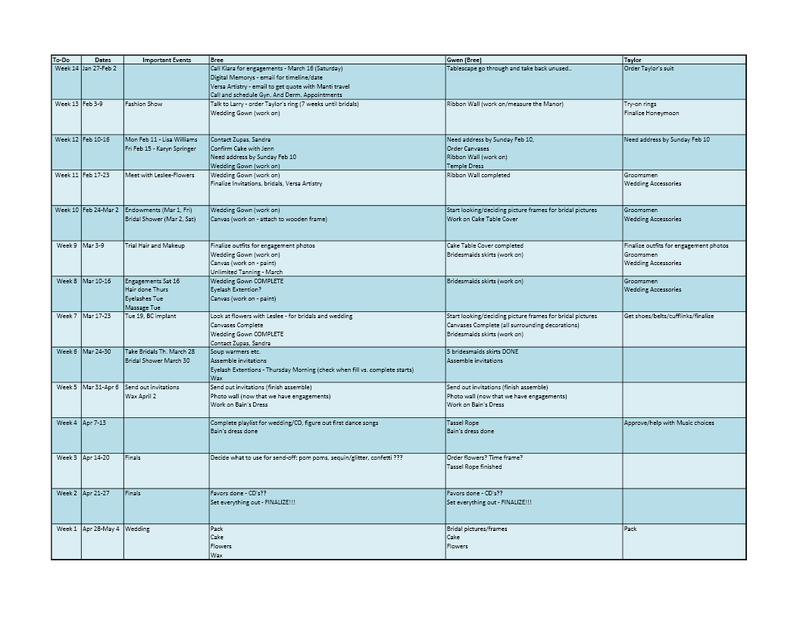 Below is my schedule (you can click on it to make it bigger) of what needed to get done and when - At the beginning of each week I would look at this schedule and send personal emails with specific to-do lists to my Mom and Taylor, of course I'd make one for me too. I had to be super organized or things wouldn't get done. It worked out great, we weren't incredibly stressed the last couple weeks because we tried to have everything done early, and the day-of was as smooth as can be. It really pays to be organized and have awesome people on your team who work hard to get things done. Finally there was my day-of schedule which everyone got multiple copies of! Haha I sound like a crazy person - but being the bride and the wedding designer/planner - I wanted everything to run smoothly and be everything I dreamed it would. And it was. The night before I think my whole family only slept a couple hours (Taylor and I put off honeymoon packing and making our wedding playlist (we didn't bother with a DJ) until the last minute and my mom and dad were just finishing up finalizing last minute decoration details that took much longer than anticipated) - but I don't think any of us would have really slept much anyway. Next I will talk about the process of executing the wedding - making all the inspirations and plans a reality!